That’s when I turned my back on practicing law—for me, a comfortable but unpleasant way to make a lot of money—and discovered planned giving. After inaugurating the planned giving programs at Iona College, and then St. John’s University, I recognized I had a talent for managing start-ups. I wanted to be an evangelist for planned giving, but again abandon my comfort zone. As Martignetti Planned Giving Advisors, I began consulting in 2003. Anticipating the degree to which charity regulators would enforce the laws at the state and federal levels, I wrote the book Charity Registration: State-by-State Guidelines for Compliance. Published in 2008, it remains the only comprehensive manual of its kind. The book signaled an expanded practice for me: nonprofits that did not have the workforce to complete the registrations themselves, sought help from me and my staff. 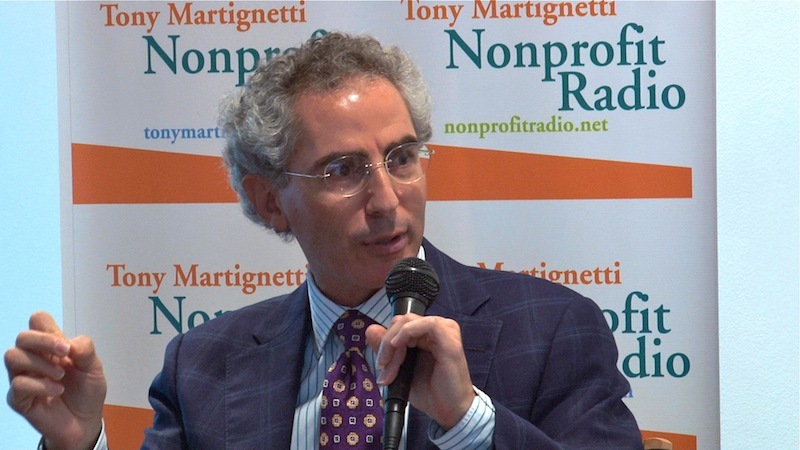 Tony Martignetti Nonprofit Radio, my podcast, kicked off in July 2010. I love it! I host 50 shows a year, picking the brains of authors, consultants and thought leaders to help small- and mid-size shops. Nonprofit Radio is my way of giving to the charity community beyond my consulting practice. I’ve been quoted in a bunch of media, like The New York Times, The Wall Street Journal and other places you’ve heard of. I do a ton of talking, including keynoting. Audiences like me. More on my speaking here. In the Air Force in the 80’s, I held the keys to nuclear missiles. I have degrees from Carnegie Mellon University and Temple University School of Law. You can catch me doing stand-up comedy in New York City.